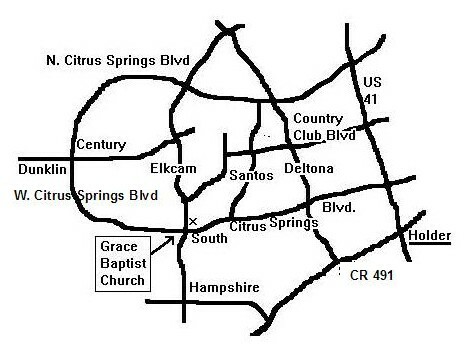 Grace Baptist Church is conveniently located in the heart of Citrus Springs, Florida, less than a 20 minute drive from Dunnellon, Beverly Hills, and Crystal River. From Dunnellon - Take U.S. 41 south to the traffic light at Citrus Springs. Turn right on Citrus Springs Blvd. North. Proceed to the second STOP sign and turn left on Elkcam Blvd. to W. Edison Place (approximately 1.25 miles). Turn left on W. Edison place into the church parking lot. From Beverly Hills - Take County Rd. 491 north. Turn left at the Texaco gas station on to Hampshire Blvd. Turn right at the first STOP sign. This is Elkcam Blvd. Proceed north past another STOP sign. W. Edison Place is the first right. The church is visible from the road. From Crystal River - Take County Rd. 495 north to Citronelle. Turn right at the Chevron gas station on to Dunklin Road. Go straight to the STOP sign, and cross over Citrus Springs Blvd. (Dunklin now becomes Century Rd.). Proceed past the Citrus Springs Elementary school on your right to Elkcam Blvd. Turn right and proceed south on Elkcam. Turn left at W. Edison Place.